The Lunenburg Water District is committed to providing our customers with high quality drinking water that meets or surpasses state and federal standards. This report is being sent to inform our customers of the results of water sampling completed in 2018, as well as information regarding the operation of the District. We would like the residents of Lunenburg to feel confident that their drinking water complies with all required contaminant level monitoring. The Environmental Protection Agency (EPA) and Massachusetts Department of Environmental Protection (MassDEP) have sections that are worded by them and must be included in this report. Much of the information must pass from year to year, so you may notice a lot of repetition. Do not hesitate to call if you have any questions, or concerns. The water supply for the Lunenburg Water District includes 4 active wells and one inactive well on Lancaster Ave. MassDEP I.D. numbers for these wells are 01G, 02G, 04G and 07G, the inactive well is 03G. We also have an additional well located near Hickory Hills Lake (06G), this well has been classified as inactive as well. Our most recently installed well is located on Leominster Shirley Road called the Keating Well (08G). One of the wells has full generator backup, and 2 have mechanical gear operators that allow water to be pumped without electricity. We are looking into adding a generator at the Lancaster Ave. site to have all the wells available during a power outage. All wells are treated with a chemical called sodium hydroxide. This chemical is added to raise the pH of the water from its raw condition of 5.8 to a pH level of near 7.6. The addition of this chemical prevents corrosion of copper pipes and the leaching of lead from solder used in household plumbing. The Water District was authorized by MassDEP to sample for copper and lead once every 3 years rather than every year, due to the excellent results in past years samples. None of the water lines that feed homes are lead service lines. The water lines are either copper or plastic tubing, or in rare cases iron pipe. At certain times of the year the water is treated with sodium hypochlorite (chlorine). This is added to destroy any bacteriological organisms. The highest dosage of chlorine s added during April and October, when hydrant flushing is taking place. When chlorine is injected, our goal is to place the most minimal dose possible, so that residents are not aware of its presence. We presently have 2 storage tanks, a 2.8 million gallon tank on Chase Road., and a 500,000 gallon tank on Sunnyhill Road. These provide storage during peak use and for fire protection. We are also responsible for maintaining approximately 50 miles of water main ranging in sizes from 4” to 16”. The Lunenburg Water District has an emergency interconnection with the city of Leominster. This interconnection allows an alternate source of water in case of an emergency for both water systems. A 3 member Board oversees the operation of the Water District. Each member is elected to a 3-year term and must reside in the Water District. Board meetings are held on the second and fourth Wednesday of each month at 7:00 pm at the Water District Office, located at 50 Lesure Ave. The public is always welcome, and encouraged to attend. If you have any questions regarding the water system, water quality reports, or any matter, contact the Water District Office at (978) 342-9211. Everyone is willing and able to answer any questions or concerns about the water quality, billing, or operation of the District. On this web page you can find general information about the Water District. You can click the “Online Pay” to make payments online. We also will put emergency notifications on to keep residents informed about water outages. You can also follow us on Facebook for up to date information. The Water District must adhere to a water withdrawal permit that is issued by the MassDEP. This permit has a requirement that we must implement water restrictions when the stream flow in Pepperell hits a certain flow rate. Our restrictions are pretty minimal for the initial trigger, which is the no use of water for non-essential purposes from the hours of 9 am to 5 pm each day. Due to the weather and residents adhering to the stricter policies that took place last year, we do not foresee having to implement any new water restriction for this coming year. Inorganic Contaminants - such as salts and metals, which can be naturally-occurring or result from urban storm water runoff, industrial, or domestic wastewater discharges, oil and gas production, mining, and farming. Pesticides and Herbicides - which may come from a variety of sources such as agriculture, urban storm water runoff, and residential uses. Organic Chemical Contaminants - including synthetic and volatile organic chemicals, which are by-products of industrial processes and petroleum production, and can also come from gas stations, urban storm water runoff, and septic systems. Radioactive Contaminants - which can be naturally occurring or be the result of oil and gas production and mining activities. In order to ensure that tap water is safe to drink, the Department of Environmental Protection (MassDEP) and U.S. Environmental Protection Agency (EPA) prescribe regulations that limit the amount of certain contaminants in water provided by public water systems. The Food and Drug Administration (FDA) and Massachusetts Department of Public Health (DPH) regulations establish limits for contaminants in bottled water that must provide the same protection for public health. All drinking water, including bottled water, may reasonably be expected to contain at least small amounts of some contaminants. 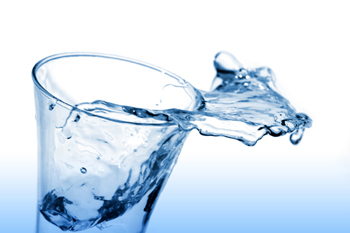 The presence of contaminants does not necessarily indicate that water poses a health risk. More information about contaminants and potential health effects can be obtained by calling the EPA’s Safe Drinking Water Hotline (800-426-4791). Some people may be more vulnerable to contaminants in drinking water than the general population. Immune compromised persons such as persons with cancer undergoing chemotherapy, persons who have undergone organ transplants, people with HIV/AIDS or other immune system disorders, some elderly, and some infants can be particularly at risk from infections. These people should seek advice about drinking water from their health care providers. EPA/Centers for Disease Control and Prevention (CDC) guidelines on lowering the risk of infection by cryptosporidium and other microbial contaminants are available from the Safe Drinking Water Hotline (800-426-4791). Do I Need To Be Concerned About Certain Contaminants Detected In My Water? A cross connection is the back siphoning of a non-potable source of liquid into your drinking water pipes. Sources of potential cross connections are pools, boilers, irrigation systems and drains. The potential for back siphonage occurs mostly when flushing of hydrants, fires, or broken water mains. During these periods, the water pressure is decreased substantially and in worst case scenarios there is a negative pressure. In this case, any Water District piping that is in contact with another source of non-potable liquid from your home will be drawn backwards into your homes piping and eventually back into the water main. When the water pressure in the water main returns, it will push the non-potable liquid throughout the water system. Depending on the liquid, it could potentially cause a serious health hazard to every resident of the water system. To limit the possibility of cross connections, the Water District surveys all buildings that may potentially have illegal connections that connect non-potable sources to the Water District. If a source of cross connection is found, the owner of the property must install a certified backflow preventer that will stop back siphonage. Homeowners can limit this potential by installing vacuum breakers on outside faucets and irrigation systems. If you have any questions or need assistance in determining if a cross connection is present in your home, please contact the Water District for an inspection. There is no charge for this inspection. Our goal is to eliminate all possible sources of contamination that could occur. Maximum Contaminant Level Goal (MCLG) –The level of a contaminant in drinking water below which there is no known or expected risk to health. MCLGs allow for a margin of safety. Maximum Residual Disinfectant Level (MRDL) -- The highest level of a disinfectant (chlorine, chloramines, chlorine dioxide) allowed in drinking water. There is convincing evidence that addition of a disinfectant is necessary for control of microbial contaminants. Maximum Residual Disinfectant Level Goal (MRDLG) -- The level of a drinking water disinfectant (chlorine, chloramines, chlorine dioxide) below which there is no known of expected risk to health. MRDLG's do not reflect the benefits of the use of disinfectants to control microbial contaminants. Action Level (AL) – The concentration of a contaminant which, if exceeded, triggers treatment or other requirements that a water system must follow. 90th Percentile – Out of every 10 homes sampled, 9 were at or below this level. Variances and Exemptions – State or EPA permission not to meet an MCL or a treatment technique under certain conditions. Massachusetts Office of Research and Standards Guideline (ORSG) – This is the concentration of a chemical in drinking water, at or below which, adverse health effects are unlikely to occur after chronic (lifetime) exposure. If exceeded, it serves as an indicator of the potential need for further action. MassDEP has reduced the monitoring requirements for some groups because the source is not at risk of contamination. The last samples collected for these contaminants was found to meet all applicable US EPA and MassDEP standards. 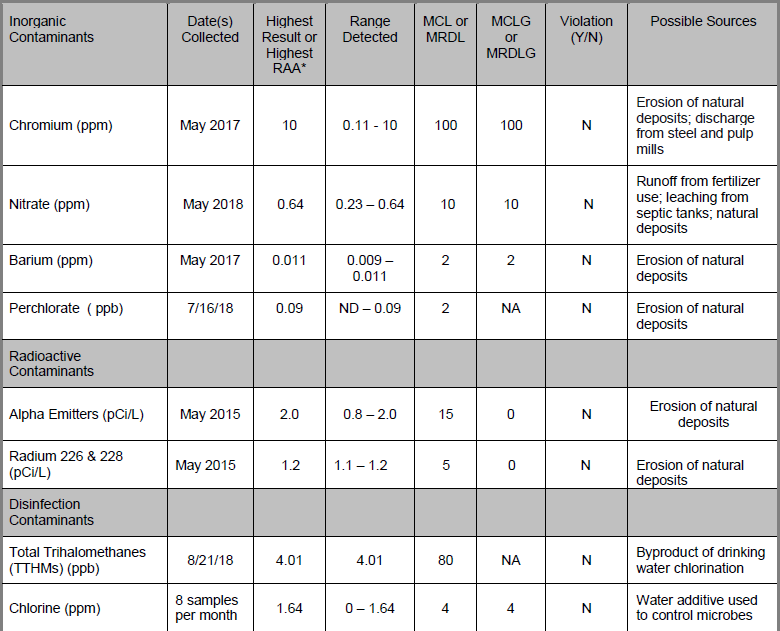 The following results are from sampling completed in 2018, or during the most recent monitoring period for each contaminant group. Only the detected contaminants are shown. * US EPA and MassDEP have established public health advisory levels for manganese to protect against concerns of potential neurological effects.